Images for summer Creator and City Volcano Explorers sets have emerged, which is not surprising given they are launched in the USA next month. They provide us with our first official images of 60134 Fun in the Park, featuring 14 minifigs, a baby and a wheelchair. Furthermore, this picture of a hitherto unknown Volcano Explorers set, 60125 Volcano Heavy-Lift Helicopter has surfaced. The 1277-piece set was not shown at any of the toy fairs so it's safe to assume that it will be a store exclusive. It's odd that the range of six Volcano Explorers sets contains two somewhat similar helicopters. The Heavy Lift Helicopter 60125 was already seen back in March, on some display on some fair hehehe... Eurobricks had some pics. I like it a lot! Now, I understand LEGO is going for including more females and other gender-equality stuff, but it's not the most realistic to have women painting fences and mowing lawns. That giant heli is the coolest set out of the whole subtheme. Also, Twin Spin Helicopter looks a lot less ridiculous in the official product pic. Interesting that the brick-built volcano has been placed on top of the existing digital volcano to try and make it look more impressive than it really is. On-topic: I'm looking at the images of the bigger sets for the first time - unless my eyes deceive me, that's a lotta BURPs. 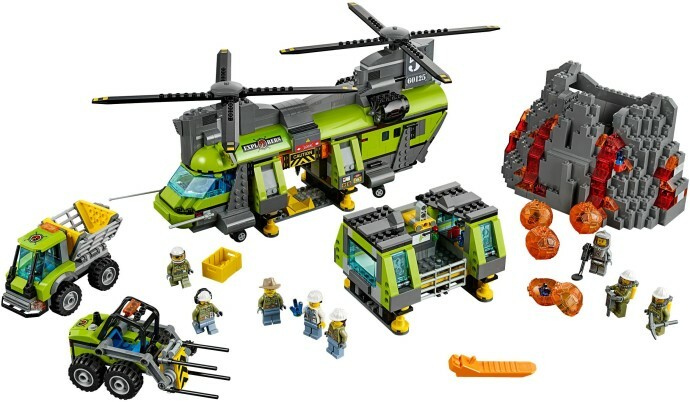 So this Helicopter set includes buildable volcano parts, as well as those included in the Exploration Base set? I think the two helicopters look rather different. I like the twin rotor helicopter, to me, it has a very distinctive look. The single rotor helicopter looks like many other City helicopters that have been released over the past few years. This is like a blend between City, Rock Raiders, and Power Miners....I kinda like it! I'm glad Lego City found something unusual to branch out on. The whole volcano explorers sub-theme is basically a lime green variant of the polar explorers sets from a year or so back. No bad thing to be honest, as those were some pretty solid sets, but it's a shame that LEGO's business model these days involves constantly retiring lines that, back in the olden days, would run for years and years. @packer221 ooh so it's unrealistic for women to paint or mow a lawn? Why is that, hm? Are you suggesting those jobs aren't "women's work", or that women aren't capable of doing them? Funny, I've never known those tasks to be gendered, nor have I ever known women to be incapable of or unwilling to do either. Check your sexism, it has no place on a community board like this. I'm not a fan of so many helicopters. One was inevitable I suppose, but two in one sub theme? And so many Burps is.... Yeah. I'm super excited for that summer fun set though! @Packer221: It's not really unrealistic, either. Just depends on where you live and what kind of neighbors you have. Good to see the heavy-lift helicopter has another bit of volcano landscaping! This one is even bigger than the other one in terms of width, though it doesn't seem to wrap all the way around like the one in http://brickset.com/sets/60124-1/Volcano-Exploration-Base... so really more of a cliff face than a corona. I honestly don't feel like the two helicopters look alike at all. One's much larger than the other and has dual rotors. Still no new pics of the Service Station set, which I'd love to see in more detail. But I guess it's only a matter of time. Also kind of a shame there's no alternate pics of the Creator sets, since I'd love to see the other builds more closely. I think the brick-built helicopter looks awesome, and so many great parts. If I get one set from this range, this will probably be it. Also, of all the fantastical stories created by Lego, a woman painting a fence is the most difficult to believe? Women paint fences and mow lawns all the time, I know it's a harsh reality but you must accept it. Complements to the designer of 60125 because it has a rather neat and seamless feature: It can airlift two research/work modules, Without them dangling beneath the helicopter and wobbling in all directions. On the boxart one module forms the middle section of the helicopter while the other is standing on the ground. The Heavy Lift Helicopter looks amaizing and I couldn't V help but notice that the rocks that have crystals inside now open by the sides unlike past rocks where they opened in the "waist." The Fun At The Park is a must buy for me as well as the Gas Station (my Imperial vehicles need fueling and the Emperor promised that half the cost the civilians paid is going to fund City projects as well as war funds, not necessarily in that order). @Megalodon86, ah yes, you're right (http://www.eurobricks.com/forum/index.php?showtopic=111781&st=1050) although there was no box image as far as I can tell. So....if the next smallest set (60124) being the largest until now has 824 pieces and 6 minifigures at $120 USD, I'm genuinely scared as to how much 60125 will cost with 8 minifugres and a whopping 1277 pieces. With the price/piece ratios for these lines, I don't think it would be crazy to expect this set to be at least $150 USD. Other than the modular city buildings, would that make this the most expensive City set? Looks like they are a Boeing Chinook and a Sikorsky Sea King. Very different aircraft. Too bad the sets didn't include the ability to build lava flow, I know there is a little flow off the volcano, but having it continue would have been new and different. As it is, kinda just same ol' stuff...but I'm sure it will be exciting to many new lego fans who are just discovering lego. I do like the park set. These sets prices are getting out of hand. This is one of those times LEGO should have used a raised baseplate (yes I said the b word) to keep the costs down. They should have used it in this set and the other one with the ugly volcano. Kipper is right, the set will have to be at least $150 and for $20 more I'll get a modular building with 1,000 more pieces. I like the drone in 60124! Is that a debut? I would say the helicopters from the Volcano subtheme are similar in that they have a similar color scheme. But the designs seem completely different. I'm excited to see what the twin rotor can do. Looks like it has interchangeable cargo (as the heavy-lift name suggests). The volcano in set 60124 looks pretty good. I know it's made of BURPS, but it still looks good. I'm sure that it looked different at the toy fair, because I remember that there was a lot of hate for it being pathetically small, but that looks quite big! @kipper147: If you also exclude trains yes, otherwise, no. I don't know what's typical where some of you live, but yes, plenty of women mow the lawn and paint - I'm not sure who else would've done it in the all-female household in which I grew up, or indeed in the many homes where men and women share jobs based on who's available and good at stuff, what with it now being the 21st century. As for the idea that gender equality activists never complain about this kind of thing being depicted: simply not true. And one of the reasons we do agitate for women to be shown doing stuff like that is that we want to see girls and boys growing up with the idea that it's normal, and toys influence that. I was happy to see TLG depicting that in the set and it's weird that people are apparently so threatened by it. I notice that the big volcano set says "Retail - limited" under availability, unlike the others. It's also got a surprisingly high piece-count (looks like there might be quite a few small grey bricks in that volcano as well as BURPs), so I'm wondering if this is going to be a [email protected] exclusive, or perhaps targeted at bigger TRU stores? I notice there's also some duplication across sets in that the vehicle with crawler treads can be bought on its own or in the other large set - seems like they're using overlap to make the same types of vehicles available across a range of prices. What is the big deal about a woman painting a fence or mowing a lawn? IMO The correct answer (and no, not the 'PC answer' either) is 'nothing'. Leave up to some people to complain about what a little plastic figure is doing in a toy set. Anyway back to the set. I will be getting a couple of these. The nice thing as it is not an exclusive (or does not appear to be) I will be getting it on sale (hopefully for 30% off). That's a nice helicopter, cool to see a front end that is at least partially built, and the lift module is interesting. The volcanoes themselves are still a bit perplexing, as though we're seen a rough-draft of a design. Agreed about this being the perfect place for a raised baseplate. The heavy lift helicopter looks like something from Thunderbirds or Space 1999. It has two removable pods like Thunderbird 2 or the Eagle Transporters. I wonder whether there is another detachable pod hidden in the trailer of the Volcano Exploration Base trailer unit. Not a huge fan of the volcano sets. Looking forward for the limo / jet combo a lot. And the Creator lighthouse looks really nice I think. Why is it not at all unexpected that the guy complaining about women mowing lawns has a STAR WARS avatar? @FlagsNZ Thunderbirds and Space 1999?? Wow, talk about throwbacks lol!! Would be awesome if TLG came out with sets of those shows!! Those shows were couple of the best in those days.. The "park" set seems pointless. Isn't #9348 pretty much the same thing and has been around for about 5 years already? The little truck in the heavy lift chopper set has a couple of pieces I don't remember seeing since I was a little kid in the 70s - and even then I feel like they were in sets my older brother had. The yellow triangular plate/panel things. Or have I just missed the sets these have appeared in? "Are you suggesting those jobs aren't "women's work", or that women aren't capable of doing them?" No, actually, you're the one inferring that's what was meant. Who's to say what gender a minifigure really is? Stereotyping the minifigures just because they have long hair, a beard, or a dress? Isn't a small part of the gender equality argument that people get to dress however they want while doing whatever job they choose? The fence painter could be male, the one at the picnic table could be female, it's all in the imagination of the person looking. ^ Exactly. People are wondering why there are pictures of a mixture of parts making new mini figures. Because it's showing you what you can do with LEGO! 60125 Heavy Lift looks like a reworked version of 4439 Heavy Lift from 2012's Forest Police. That'd make it an 8-stud vehicle, and 60123 a 6-stud. I think they'd look pretty good alongside each other, or even with a colour-MOC'd version of 60034 from Arctic Explorers. Might be fun seeing how easy it would be to get 60034 carrying the extra "pod" from 60125. Good. It's about time Lego did some helicopters. Ugh, can we please avoid saying thing like "it's not the most realistic to have women painting fences and mowing lawns"? Because a) It's untrue (seriously, did we all get warped into Leave it to Beaver while I was asleep?) and b) this is the type of thing that makes fandoms look inaccurately sexist or otherwise exclusionary. Lego's been doing a really good job of including a decent percentage of female minifigs (often a perfect 50% in CITY) and this is something we want to continue with civil SUBTLETY. We DO NOT want the politically correct brigade on our heels for every little decision Lego makes, because there's no pleasing these people. They reacted NEGATIVELY to the wheelchair in this set, because it is never, never enough. Lets stick to the positives - this is an awesome world-builder and parts pack with some sweet new pieces. Lego is clearly listening that people love and want more minifigs, this set is an all-around "win" in my book. That price for the service station is awful. 500 pieces and $90? Why is it so expensive? Wow... look at that dual rotor beast. I have a soft spot for things with spinning blade, and that over there has two...! @I dont have a name, I think (I hope I'm wrong) LEGO knows that us loyal fans have been waiting for a service station for forever and will pay whatever is necessary to get one. The price is rubbish because they want more money. Anyway, I hope it's just a mistake or something because I would like to get it too without paying such an absurd price. Packer221 has every right to make his comment, so please don't go down that 'check your...' road or try to ban someone or some comments because you don't agree with them. I don't personally agree with him and there is nothing to stop a male minifig from mowing - but really who cares. The real issues are those prices - $90 for a service station? Who knows what that will be in Canada I wanted it but not at that price. No excuse with the low price of oil today. I think I read it will be $110 there (eek!, almost 22 cents a piece!). Lol, about oil though, as it's right at a 3-month high today. Sorry to bit*h again about this, but at 17.5c USD per piece, that's double the price count of many **2016** CITY sets!!! ^Picture it this way, 60117 has almost half as many pieces for 78% LESS! Even compared to the airport sets, that are expensive due to there being large parts like cockpits, the service station is expensive. City is one of my favorite themes, but I'm not buying that. And the new airport looks rushed and just flat out awful. Worst year ever for Lego City. I remember 2007-2009. Those were the best years.